This article is re-posted from GreenPeace. Donors Trust and Donors Capital Fund, based out of the DC suburb of Alexandria, VA, have sent $118 million to the “climate denial machine” from 2002-2010, according to a Greenpeace analysis featured in the Guardian. 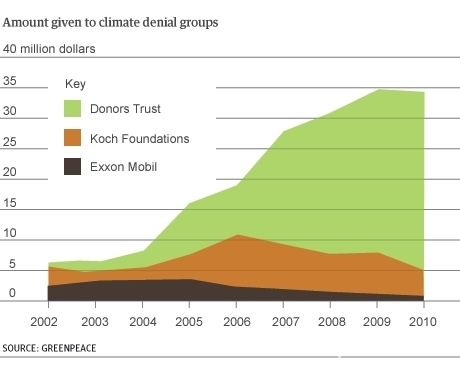 The graph above, from the article, illustrates the significance of this money as compared to giants like Koch and Exxon. Of course, the Koch brothers are part of the Donors Trust network, using the donors groups to hide their own giving to a variety of corporate front groups. Because of the obscurity provided by donors, we don’t know exactly who is getting exactly how much of the Koch payments to Donors Trust and Donors Capital Fund. An accompanying article by the Guardian shows how the donors groups provide large portions of organisations’ entire budgets, such as the Committee For A Constructive Tomorrow, which even among climate deniers is notably anti-scientific. The group’s most visible product is the website, Climate Depot, a contrarian news source run by Marc Morano. Climate Depot sees itself as the rapid reaction force of the anti-climate cause. On the morning after Obama’s state of the union address, Morano put out a point by point rebuttal to the section on climate change. Americans For Prosperity Foundation (AFP) got $7.6 million from donors groups in 2010, 43 percent of its budget. AFP Foundation is chaired by David Koch and has received millions in direct funding from Koch foundations since the Koch brothers founded it. Committee For A Constructive Tomorrow got $1.3 million from donors in 2010, 45 percent of its budget. Cornwall Alliance (through the James Partnership) got $339,500 from donors in 2010, 75 percent of its budget. Heartland Institute got $1.6 million from donors in 2010, 27 percent of it’s budget, which came from Chicago billionaire Barre Seid (see p. 67). State Policy Network (SPN) got 36 percent of its 2010 budget ($4.8 million) from donors. SPN members include just about every climate-denying organization and every conservative think tank in the country, including AFP and Heartland. Koch is clearly embarrassed by the negative publicity. Koch “Facts,” the company’s PR website that lashes back at unfavorable reporting on Koch, attempted to respond to the flood of press on the donors groups without mentioning them by name. Similarly, Donors Trust president Whitney Ball has done her best to keep Donors Trust and Koch from being synonymous. To be clear–they are not, but the Kochs and their operatives are key players in the Donors network, with people like Arthur Brooks of the American Enterprise Institute and Steven Hayward of the Pacific Research Institute helping oversee donors operations, including millions in funding to their own organizations. ← A Keystone Moment: How Will Obama Decide?